Pair of color circles (pure and mixed colors). The Traité de la peinture en mignature appeared in many editions printed throughout Europe from about 1672 through the end of the eighteenth century. 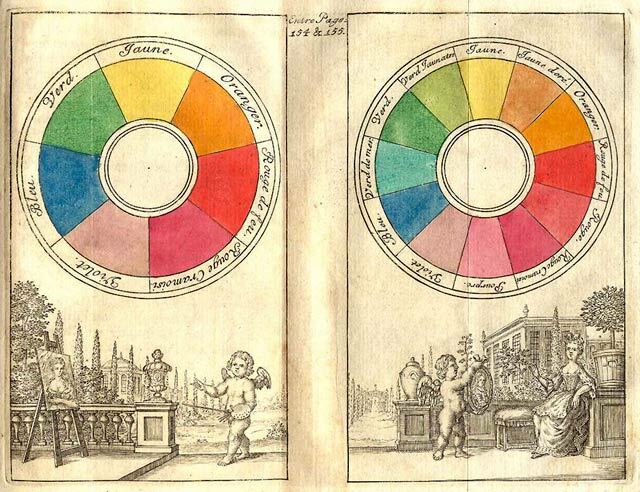 These color circles, from a 1708 edition, are the earliest published examples of Newton-style color circles in an artist's manual. Source: [C. B.] Traité de la peinture en mignature (The Hague, 1708). Credit: Courtesy Werner Spillmann collection, Basel, Switzerland.